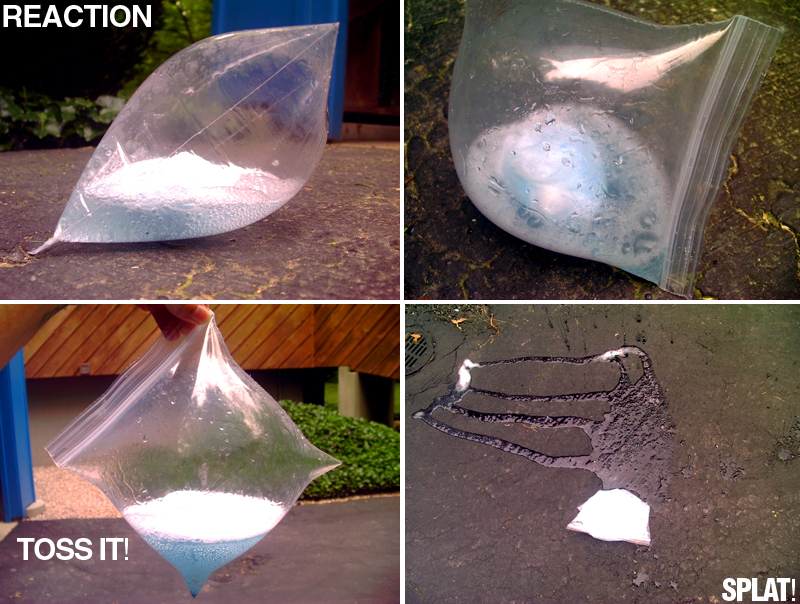 Create an explosion in a bag to explain the the three states of matter! LIQUID - Pour 1/4 cup of warm water into a ziploc bag. Next, add 1/2 cup of vinegar to the water (food coloring optional). SOLID - In a tissue, dump 3 tsp. of baking soda. Fold the tissue up like a square. Then, close the bag up, leaving space to drop the pouch. Zip it up, let go of the pouch, and watch the bag expand - GAS! Soon the bag will look like a giant bubble. What's happening inside: an acid-base reaction, creating CO2! QUICKLY, grab your bag and throw it! SPLAT, watch it pop! Visit Science Bob to turn this into a science fair project! We just did this a few times. Fun! Thank you!